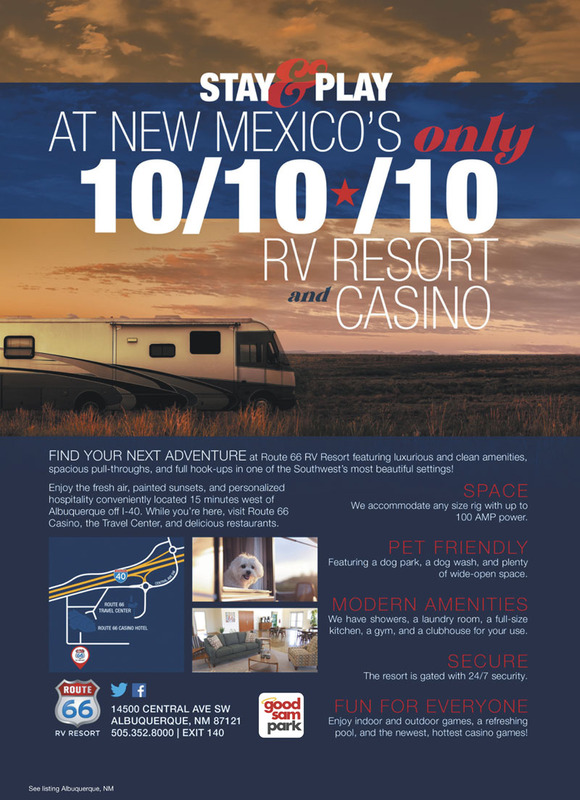 ENJOY THE NEW ROUTE 66 RV RESORT! Our 10/10*/10 rated Resort is just minutes west of Albuquerque on historic Route 66. A perfect destination with luxury amenities, gorgeous pool & spa, Route 66 Casino Hotel, Vegas-style gaming, restaurants & entertainment. Very new and in great condition. Facilities look great. Nice, long spaces. Friendly staff that guides you to your space using a golf cart as a pilot car. Naturally there’s a free shuttle to the casino. But it’s very pricey. So many things to say about this park. First & something I’ve never seen before...the park office is staffed 24/7. There are 2 bath houses. We used the one in the back during our stay. The day we left we checked out the amenities center and although the bath house in the back I would rate a 10, the one in the front I would rate a 12. They also had a pool table, games, books and a computer area available. Spaces were wide and all had picnic tables and fire rings. If you are traveling with a pet, they even have a pet wash station. They offer a free shuttle to the casino 24/7. I would also recommend the buffet in the casino. If you are staying in Albuquerque, I highly recommend this park. We like to stay in casino RV parks for overnight stops on long trips in our motorhome. They are usually no-frills parks (mostly parking lots), convenient to the highway, with onsite restaurants, good access to diesel and good security. This park was a total surprise! This is a fully developed RV park, with big-rig friendly asphalt roads, concrete pads, spacious landscaped sites, picnic tables, fire pits, a very nice clubhouse, pickle ball court and an excellent pool/hot tub area with beautiful views of the mountain range south of Abuqueque. It is right off of I40, but the RV park is behind the casino and very quiet. They run a shuttle with door-to-door service to the casino and a couple of local attractions, but it is also a pleasant walk to the casino. There are several good restaurants inside and the gaming area is clean and well kept. The only thing lacking here is shade. 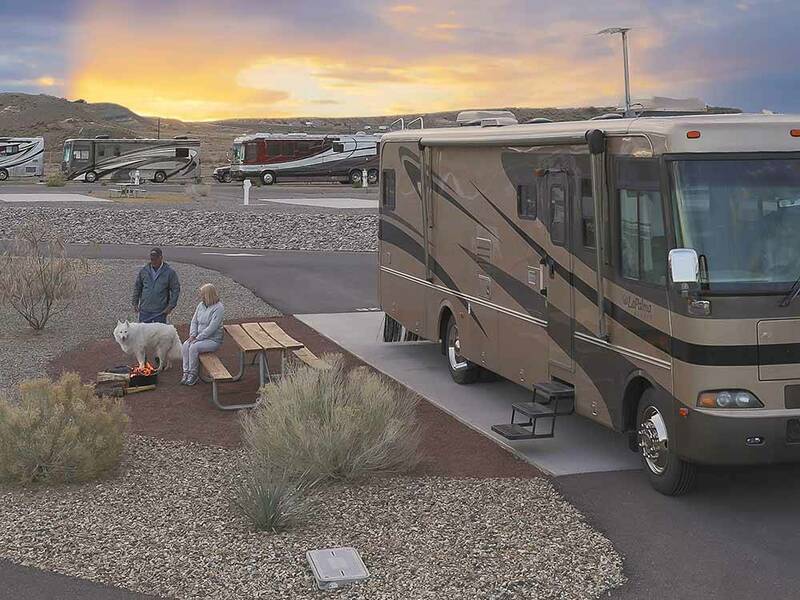 This is a beautiful RV park located on the Route 66 Resort Casino grounds. It is a large park, impeccably maintained. The sites are hardscaped to match the surrounding desert style. Actual pads are long, wide and level concrete. All roads are asphalt. Hook ups include 30/50 amp on lighted standing enclosures. Water and sewer are also provided of course. No cable but we got over 50 air wave channels with the HD scanner. The amenities center is large and features vending machines, Foosball table, pool table and shuffle board. Wi-Fi is very good throughout the park. Showers and restrooms, though few, are clean and well maintained. In a separate area, there is a beautiful pool and spa. For pet owners are the two grassy, enclosed bark park areas with bags and receptacles. They appear to be watered each morning. If you so desire, call the number provided and a free shuttle will take you to the various stops at the casino and resort. The park is located away from the city about 20 miles west of Albuquerque with easy on/off from I-40. Gas, diesel and propane are all available on the resort grounds. Class A with 4 adults and tow car was $50 with GS discount. The staff was very friendly and escorted us to our site. We stayed here twice in a weeks time. Great park. This RV Park is all brand new. It is a part of a casino. The staff seems to take pride in keeping the place in neat and clean status. There was a well kept dog park and putting green. We did not use restroom or other facilities. The sites have a nice amount of space between them. It does not have the feel of a parking lot at all, as some parks in the area do. They have done a wonderful job landscaping and making it look all quite natural. The reason I put 4 for "appeal" is I would like to have had some grass at my camp site. We were in the "luxury pull thru" sites. All we had was rock. I know that is pretty much standard for this part of the country, but some of the back in sites here did have grass. Seems to me a luxury site could also have grass. All in all, I would highly recommend this RV park and would stay here if in the area again. Very clean and well laid out. The signage to the location is much smaller and more difficult to see/read than what I was expecting. If arriving after sunset be prepared for a very dark navigation. The roads are not well lit. But manageable. The dogs enjoyed the enclosed dog park. The shower house/restroom was clean and in order. Would stay here again. Lots of space and nice hookups. Very clean all around. Nice and quiet. Friendly staff. We were scheduled for a one night pass through and stayed another. This park is brand new and adjacent to a casino, if that's appealing to you. The facility is truly remarkable. The rec room is comfortable and spacious, the bathrooms are immaculate and lovely and a full service kitchen is available. Our only complaint was the accessibility to these fabulous amenities. There are no walking paths so the only way to reach them is to follow the roads, which are obviously used by guests towing rigs and not well lit in the evening. We were a fair distance out in the park so this was not a particularly desirable option. The facilities were exceptional, however. Spacious park, easy to find: right behind the Route 66 Casino, which is visible for a long way up and down I-40. Because it's set back there's not a lot of road noise. The office was always helpful. It's about 14 miles west of Albuquerque but that wasn't a bother. They offer a shuttle to various nearby locations; I didn't use it so I can't comment on its quality. All in all, a great experience. Great place overall. Huge level sites with concrete pads, two dog parks, 24 hour front desk, super clean amenity center with full kitchen, laundry room, computer room and squeaky clean showers. Very convenient to I-40 and just enough west of town that the skies are dark at night and it's quiet. Make a reservation though because the word is getting out about this great park. Nicest RV park we've ever stayed in. Huge paved parking spots and angled so that your view is not the RV next door which is great here because the view is beautiful. The manager and staff are helpful and friendly. Office is open 24/7. The nicest pool we've ever seen in an RV park and a great casino right next door. I wish you had more stars for this one. We went for 1 night and stayed 3. The pool was so great. The community house was so great not enough words to describe. All was so clean. The people in the office were so great and very helpful at all times. We will be back to this one for sure.!!!! Easy in and out once you figure out it is located behind the casino. Large level sites. No shade. Very nice park though and would stay here again. This park is very well maintained. We intended on staying here for just a night as a pass through but decided on an additional night. If you are expecting a park with tons of grass, old growth trees, and tightly packed RV spaces you need to keep looking. This is the desert portion of NM and their landscaping is primarily decorative rock. There is an entire row or slips with a patch of grass right out your door, but all others have crushed rock. All pads are level concrete and smooth asphalt roads to get you in and out. Some people complained about the highway noise at night, but on my nightly dog walks I could only hear road noise in the West 1/3 of the park. And speaking of dogs, they have two dog parks and both of them have real grass in them. Laundry and shower facilities were clean, pool looked nice, grounds are well maintained. Trash pick up at 9AM everyday. Staff was very accommodating. Oh and the wide space you get between your neighbors is outstanding! Each slip has its own picnic table and firepit which look like they were just replaced this summer. The place looks almost brand new to be honest. Very beautiful view of the plains and mountains in the distance. Great resort. Awesome pool! Friendly service and helpful. This is a new RV resort that is rather stark looking today, but once it matures it will be a destination point. We will be staying here every time we travel through the Albuquerque area in the future. On this visit our primary concern was Internet access. Two other highly rated RV Parks had very tentative Internet access. At Rt 66 this was not the case. Internet access was excellent. Park had a very beautiful pool with an special long winding slide. However, the slide was not operational. Disappointing for the grandkids. Free door-to-door shuttle service to RT 66 Casino or the Rt 66 Pit Stop - Home of the Laguna Burger. This is the nicest RV Park/Resort I have ever stated in. Facility is brand new. Swimming pool with built in hill side slide, hot tub, wading area for kids, rock water fall, lots of extras. The club house had a full size kitchen, free coffee all day, two computers in a private room, showers, pool table, games, Direct TV, lots of tables, couches, shuffle board, book 4xchange, etc. Dog parks were great. Price was outstanding! You are in the desert so no trees & they are brand new. You get coupons for the casino next door, we plan to eat there tonight with out $5 each food coupon. Great park with great facilities! Office is open 24/7. Restrooms and laundry facilities are first-rate. Access to Route 66 Casino and shuttle services to local restaurants are part of amenities. The pool is beautiful and there are lots of things to do without leaving the park. This was a nice break from the ordinary RV park. Wish we could find more parks like this one! I really enjoyed my stay at this new Campground. The bathrooms and showers are spacious and extremely clean. It is located in the high desert, so don't expect a lot of shade. The sites are level concrete and spacious. Wifi is decent and there are plenty of cable channels. The drawbacks are that it's 18 miles to a grocery store and the restaurants nearby aren't great. The staff here are very friendly and helpful and clearly take pride in this location. They have a new pool & slide going in that looks beautiful. I'd definitely stay here again. Facilities were nice and clean. The parking spaces were pretty level compared to some sites I been. Route 66 Casino is walking distant but you can call the shuttle. The overall access to the RV lot was very accessible. I will be staying often just to get the camper out. I can't say enough nice things about this place. Beautiful place to stay. Clean, well maintained, nice recreational area, very pet friendly. They have a couple of fenced areas with grass for pets. The staff are exceptionally friendly. We had a problem with our awning not retracting the day we were leaving and the wind was crazy. It was a Sunday and we couldn't get a service company to come out. The manager and a nice neighbor came to our rescue. It was the manager's day off and he went above and beyond to help us. We will definitely stay here again. New facility. Long and wide spots with good distance between spots. Great staff that takes pride in the facility. Every area clean. Good access to the city and shopping. Brand new park. Paved pad for Rv, black top roads. Extremely clean. Many sites. Pull-in site large enough to leave tow car hooked up. Not crowded. Very friendly staff excellent facilities. Very happy here. Will stop again on way home. From I-40 & exit 140: Go west 0.2 mi on South Frontage Rd (L) Note: entrance is west of and behind casino.